Have you ever heard tell of the Wool and Sheep project quilt, commemorating the Gweedore Sheep War of 1856? No? Well, sadly (because it is truly a thing of beauty!) neither have I, until today. And before you wave me away, allow me to assure you that the both the object itself and the event it depicts are real, rather than figments of Flann O'Brian's imagination. Several landlords in Gweedore imported herds of Scottish Blackface sheep (from Scotland), and confiscated land occupied by locals for the purpose of grazing them. Predictably, this upset the local residents, and so when sheep began to go missing they were blamed and police were brought into the area - tightening control over the region. The conflict came to a climax when one of the landlords was raided by a group of local men. Shortly after this, they managed to find a way to allow residents back onto the land and at the same time graze the sheep. And it was only generations later, I am told, that excavation work uncovered sheeps' remains buried beside the house where the Head Shepherd used to live... suggesting that he was killing the sheep himself - although whether this was done in order to frame the locals, or out of some form of serial-sheep-killing pathology, we may never know. But in any case: To commemorate all of this, folks gathered at the Donegal County Museum in Letterkenny, and collaborated to make this spectacular quilt. Titled Olann agus Caorigh (Wool and Sheep), the quilt took several months and 150 hours to create, and is now on display at the Museum - where I wandered in serendipitously earlier in the day, attracted by their Thatched Cottage exhibit.The quilt, though, ended up being the highlight of the museum by far. The detail in the renderings of the cottages, the hillside, the people, the sheep, and the whole Gweedorian ambiance - complete with distant view of Errigal - is just stunning. The layering of textures and the selection of colours, are quite striking. And although I am no quilting expert, the sewing looks skillfully done. In all honesty, I could have stood there and stared at this quilt forever, and it was only my husband's hunger that eventually removed me from the building. So, my sincere appreciation to the group of individuals who made this quilt and to the agencies that made the project possible. And I only wish that more information was provided regarding the materials and processes used to make the quilt. Is the fabric Donegal tweed, for instance? Were the participants instructed in the craft of quilt making or were they experienced quilters? Will more quilts be made to commemorate other events in Donegal history? Will the quilt travel and be exhibited elsewhere? It's a project that deserves more publicity, and I am sure other fibre-enthusiasts would appreciate seeing it. Earlier this week, we were in the throes of a heatwave, and I used the opportunity to wash and air-dry my heavy winter knits before putting them away for the summer. This also gave me a chance to review what I had made for myself, and consider how successful it was. While I had made sweaters before on occasion, I began knitting them in earnest in 2014. The first one I made for myself at this time was a fluffy lilac thing, which I knit in super-bulky yarn on size 10mm needles, in an improvised bottom-up design in the round. I then immediately proceeded to crank out maybe half a dozen similar sweaters, which I either sold or gave as gifts. This brought more orders, and by 2016 I was all sweatered-out yet had only one, now tattered, self-knit sweater to my name! So... my goal for winter 2016-17 was to start a winter wardrobe for myself. Ideally I wanted to replace my remaining store-bought sweaters with handknits, and to no longer buy sweaters retail at all. With this aim, I started to knit in September. I began with a bulky multi-coloured Rowan yarn, which I impulse-bought on sale at my friend Lisa's shop. Working on 10mm needles, it took me only a few days to turn it into a sweater ...and I regretted it immediately, as the resulting cheery rainbow-coloured thing wasn't really 'me.' However, I get so many compliments on this sweater, that over time I grew to like it! After the bulky piece, I proceeded to 'get rid of' some dense heathery aran wool I had in my stockpile, the origins of which I no longer recall. Finally I dared to knit myself a cabled circular yoke sweater out of the Donegal tweed I had hitherto reserved for gifts and paid projects. Then came the dresses... the first of which was really an unintended outcome of my switch to top-down knitting! Once I got to the hips, I had yarn left over and thought 'might as well.' I then liked wearing the dress so much, that I wanted more of them. Two of the dresses I made in Donegal tweed, and one in another unknown-origins dense and sheepish mystery yarn that needed depleting. All in all, my handknits for Winter 2016-2017 consisted of 3 funnel-neck pullover sweaters and 3 funnel-neck sweater dresses, all intentionally quite heavy and warm, as I spent a lot of time outdoors in the cold, wind, and rain. These 6 garments basically saw me through the worst of the cold season. I rotated between them, pairing them with woolen leggings, jeans, tights and various underlayers. I did not wear any store-bought sweaters over this past winter - not out of principle, but simply because the ones I made for myself fit better and proved better suited to my lifestyle. Looking at these garments all together, I can see how much my knitting has 'come into itself' over the past year. The process of making these enhanced my love and appreciation of Donegal tweed, cemented my preference for top-down, over bottom-up construction, and reminded me how much I love to wear - and make - dresses. In the course of making these, I also - for the first time - began to note down my stitch counts, etc., and to envision some of these as future patterns. I have been making other things throughout 2016-2017 - including myriads of hats and socks, and a few sweaters and dresses for others. But prioritising my own wardrobe has proven incredibly useful. Not just in the obvious sense of supplying me with things to wear, but also in helping me hone my methods, improve my planning skills, and start thinking more consciously about design. Goal for next winter: Ideally I would like to double my handmade winter garments. Wearing the same six again and again does run the risk of 'overdosing' on them, no matter how nice the knits! I do not remember how I first learned of linen stitch (sometimes also called woven stitch, or slipped moss). It was some years back and, as with most stitches involving slipped repeats, I did not have much use for it and so promptly forgot it. Then, a couple of month ago, out of nowhere I got this notion that I wanted to try knitting a structured, tweed-like jacket. This would be a drastic departure from my normal seamless in-the-round knitting, and would likely end in disaster - as I hate knitting flat and am not great at sewing. But even as I told myself this, the desire to knit a tweed jacket would not leave me. The question was, what stitch to use to make the garment sufficiently tweedy looking. 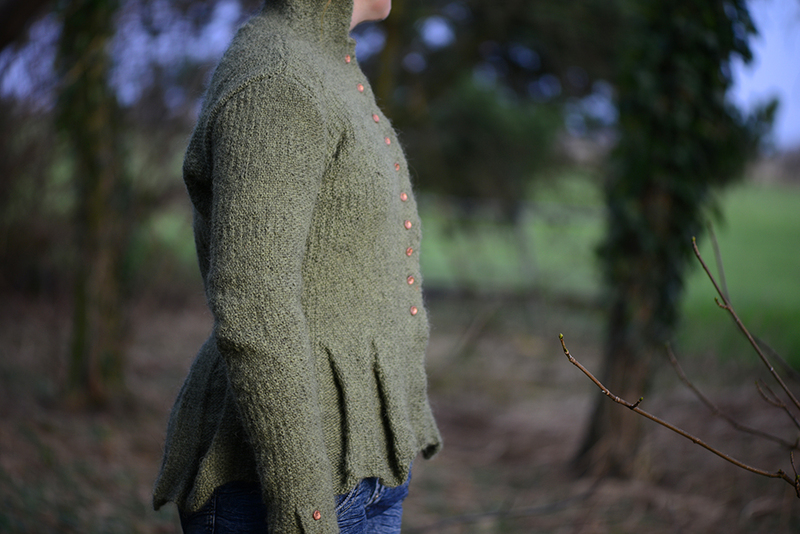 I browsed handknit jacket patterns for inspiration (of which there are surprisingly few) and it seems they mostly use some variant of moss stitch. However, this was not quite what I had in mind. I was after a dense, flat stitch that resembled woven fabric. It was then I remembered linen stitch. And, as these things often go, once it had re-entered my sphere of awareness I began seeing it everywhere - culminating with this post on my favourite knitting blog. Well, that settled it. In another departure from my normal mode of operating, I actually knitted a swatch. From the start, the yarn I had in mind for this project was Ístex Léttlopi. It is a yarn Elizabeth Zimmermann once described as 'that uniquely hairy, Icelandic wool.' And she wasn't wrong. Compared to the Irish wools I normally like to work with, Lopi is stiffer, rougher, almost jute-like in feel. For the type of jacket I had in mind, the fabric materialising from the swatch looked and felt right. For knitting in the round, obviously just continue as in 'row 1' ad infinitum. What you get, on the righthand side, is a flat, dense fabric consisting of alternating knit and slipped stitches. This stitch is not reversible, and on the underside it looks bumpy - like a cross between moss and garter. Depending on what kind of yarn you use and how tidy a knitter you are, the righthand side will resemble something on the spectrum between tweed, linen, and burlap sacking. Mine is somewhere toward the latter I'm afraid! But I was so pleased to replicate the woven effect at all, I did not let that little detail get me down. 1. Tension is crucial. This is an obvious one for anyone accustomed to working with slipped stitches, but it is worth mentioning regardless. Pulling the slipped stitches too tight (which you can see in the finished result I have done in places) will result in a puckered look to the fabric. 2. It is slow-going at the start. When I posted some pictures of my work-in-progress on instagram, a few people familiar with linen stitch commented that they could not imagine knitting a substantial garment using this stitch - it must take forever? But actually, here is the thing. It does go slow at the start. In fact, working on the peplum hem of this jacket I did begin to question my sanity. But then at some point, something clicked and the stitch finally entered that part of my brain that allows me to knit on autopilot. After that the jacket (or rather the pieces that would hopefully become the jacket - with flat knitting I am always skeptical until the end!) knit up very, very quickly. So don't discount linen stitch as an option for large garments. Now, as far as the actual jacket... In yet another departure from the way I normally knit - that is to say, improvised and always based on my own designs - I actually used a pattern. Somebody else's pattern! I decided to go that route because I really am a complete stranger to flat knitting and to seaming, and this being a learning experience I thought it best to start with an existing template. Initially my idea was to find a very basic, foolproof jacket pattern. Instead I found Beatrix by Kim Hargreaves. My friend Lisa has a book in her yarn shop library called Thrown Together. I was flipping through this book innocently when I came across this pattern and knew, with a sinking feeling, that this would be the one. Simple and basic this pattern is not (think peplum hem, short row shaping...). But it is beautiful. And so throwing caution to the wind I went with it. The result is basically what you see here. The fabric does look rather burlap sack-like, the sewing leaves much to be desired, I am still tweaking the fit, and I haven't blocked the jacket yet (should have blocked the pieces individually before sewing it up, but nevermind that now!). Still, for a first experimental attempt at hand-knitting tweed I am pleased. To my eye, my collar modification enhances the Edwardian look of this jacket, while the Bohemian glass flower buttons inject the mil-spec green wool with a bit of femininity. But most importantly, I like the tweed-like look and feel of the knit. The collar even actually stands up, so stiff and structured it is. I do think that linen/woven stitch, plus a coarse hardy wool such as Icelandic Lopi (or one of the rougher Kerry arans or Donegal tweeds), knit on size 2-3mm needles, make for a good recipe for hand-knitting a tweed-like fabric, should you desire to do such a thing. In the course of this project and related research, I have also learned a great deal about jacket construction (which is fortunate, as my previous knowledge of jacket construction was zero!). I do not hate flat knitting as much as I thought I did. And I am even warming to sewing. Overall, I feel like I 'get' it now, and can proceed to playing around with my own jacket designs ...which is to say that I haven't gotten linen stitch or the idea of hand-knitting tweed out of my system yet. In my next attempt, the goal is to aim for an even more jackety, less cardigany look. And for a more tailored fit, making generous use of dart shaping. Wish me luck! According to its definition, tweed is 'a rough, woollen fabric, of a soft, open, flexible texture, closely woven.' I suppose that nothing in that definition says it cannot be hand-knitted. And the idea of experimenting with that fascinates me.